WMEAC relies on caring volunteers like you to carry out our mission of leading environmental protection. We are all part of West Michigan’s environment, so we must work together to protect and positively influence our natural surroundings. WMEAC volunteers average 10,000 hours every year for various programs, professional, and maintenance needs! We need you to volunteer West Michigan to protect our environment! Our T4W program is an interactive, place-based watershed education program that connects middle school students to their local watershed using the tools of science and discovery! Students will engage in hands-on field work to determine the quality of a local stream. If you are interested in working with students, environmental science, or protecting our water resources here in West Michigan sign up today to become a T4W Mentor! This program has two components: an in-classroom portion and an outdoor field work portion. This training session is for the field work portion. Send us an email or call our office at (616) 451-3051 for more information. *Volunteers must pass a background check to work with students. Description/Background: Every month people who work in the environmental field meet up at informal sessions known as Green Drinks. The event is held on the third Thursday of the month in the evening at various venues throughout Greater-Grand Rapids and the Lakeshore. Attendees will vary from students and academia, non-profit, government, and sustainable business professionals. Calendar Time Scope Commitment: The event takes place once a month on the third Thursday of the month from 5:00 – 7:00 pm. Support the WMEAC table the day of the event. Most commonly either setting up or breaking down the table. WMEAC hosts a number of committees to help with our internal policies and procedures, provide guidance, and expand our network for effective community engagement. Are you interested in a more formal commitment with WMEAC? Let us know if you are interested in learning more about our Event Planning, Fund Development, Policy and Advocacy, IDEAL (Inclusion and Development of Environmental Allies and Leaders), and event specific committees like the Grand River Clean Up, Blue Tie Ball, the Annual Meeting, and Women and the Environment. 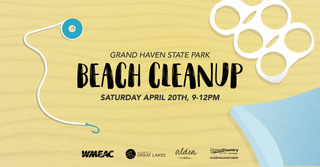 Join us on Saturday, April 20th from 9am to 12pm, to clean up our beach and better our community. We will meet at the Grand Haven State Park, look for our tents and signs! This event is free and open to the public, all ages are welcome! This event is open house style, so if you cannot make it for the entire event, we encourage you to donate the time that you have and stop on by. All supplies will be provided, however we encourage you to bring a reusable water bottle, coffee mug for complimentary Aldea Coffee, or gloves if you wish. This is a zero-waste event, we will not provide additional trash bins at our tent. In efforts to keep our planet clean consider ditching disposable items and instead bring a reusable water bottle with you to stay hydrated! Description/Background: The first Women and Environment Symposium took place in 2010 in partnership with Grand Valley State University’s Women’s Resource Center. The intent of the event is to integrate and elevate women and environmental topics and the intersections between the two. Historically, the event has held workshops, panel discussions, a keynote speaker, and presented awards. The event is held at a GVSU campus in late winter/early spring. The organization of the event committee is segmented into subcommittees including logistics, honoree, inclusion, speakers, sponsors/budget, and marketing. Calendar Time Scope Commitment: A one-time meeting takes place in the last spring/early summer to brainstorm and decided potential keynote speakers and the event theme for the upcoming event. Full committee meetings take place from September – March. Monthly Time Commitment: The full committee meets monthly at the WMEAC office from September through March. Committee members are also expected to join a subcommittee to support action items and event needs. Time commitments vary based on subcommittee. Create event concepts, themes, and topics. Create and finalize event logistics including agenda, food, location, and time. Promote the event and honoree award opportunity. Plan and organize supporting community events with the keynote speaker to compliment community engagement. Brainstorm and secure event sponsors alongside WMEAC’s Director of Development. Meet monthly with the full committee during event planning months. Description/Background: The Blue Tie Ball is WMEAC’s signature fundraising event. It occurs in April – as close to Earth Day as possible. In addition to a cocktail hour and sit down dinner, we provide a short program highlighting several programs as well as a really fun live ‘experience’ auction. Monthly Time Commitment: Committee meeting meets 1-2x/month plus some independent work. Assisting with developing a strong host committee – a group that will use their connections to recruit attendees. Description/Background: A fundraising and education/engagement lakeshore event to make our lakeshore-focused programs and initiatives more visible to the lakeshore community. Description/Background: Annual Meeting with WMEAC’s membership, donors, stakeholders, and partners to celebrate and acknowledge the past fiscal year and corresponding accomplishments at an organizational level. Event includes community time and networking, an award ceremony, and Board of Director selection by members. Event will take place in late October or November. Securing event venue and event food menu. Supporting day-of setup and breakdown needs. Do you have any questions or concerns about volunteering? *By filling out this form you will be added to WMEAC's volunteer opportunities email list. We will not send you additional information other than volunteer information.